Getting to Know Islamic Culture?was the last of the 2017 fiscal year lecture series. 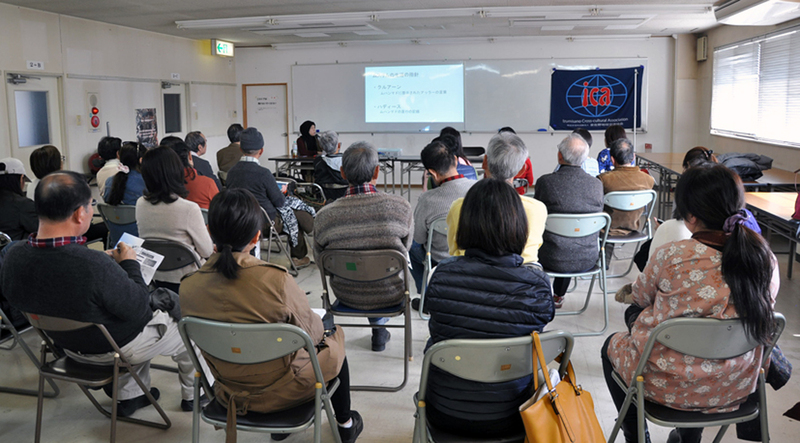 In this lecture Sarah Qureshi Yoshim ,Director of Nagoya Mosque’s External Relations, was invited?to?speak about the state of the Islam and that of Muslim children living in Japan. She helped to raise awareness to the thirty-five foreign and Japanese attendees.? ● Whether it’s Ramadan or praying, I thought that Islam was very flexible. I did not know that Islam?was a religion that cherishes peace and?values moderate viewpoints. I didn’t?even know that women?were cherished. I also learned that IS and Islam are totally different. I don’t know what’s true or not unless I take a look at all sides of various kinds of news and events. ● I was even scared of Islam, at first , based on its portrayal on the news, but now through international relationships I have?a lot of Islamic friends. African,?Indonesian, and people from other countries are good friends. I thought it was scary to see a one sided view on the news. ● When I heard the authentic?points of view?of Muslim children, as a parent with children, it felt like my heart was being torn. I strongly feel that it is necessary to obtain correct knowledge and information about Islam. ● Although it is easy in Japan to be swayed by the media, I thought?if?opportunities to hear such “true voices” increase, it will lead to?better?multicultural understanding and?create a more harmonious?society. I also want to share what I learned today. ● It is quite embarrassing. ?I’m surprised I didn’t know the true?Islam, which is quite different from the Islam I previously knew. It’s unavoidable to question?the unwavering media. It was really nice to be able to get a new understanding?by participating. ?My view of the media has changed.